Pakistan's anti-government cleric Tahirul Qadri has called on protesters to continue guarding state buildings amid a massive sit-in in Islamabad. He and another protest leader, Imran Khan, are demanding the resignation of PM Nawaz Sharif. On Tuesday the protesters entered the high-security red zone, which houses state buildings and foreign embassies. The military has urged dialogue to end the impasse between the government and the protest leaders. Reversing an earlier command which blocked all access, Mr Qadri told followers that while they should stay put at all exits, they should let people move in and out of government buildings. Mr Qadri's baton-wielding followers are currently blocking the parliament building's front exits on Constitution Avenue, says the BBC's M Ilyas Khan. The cleric had earlier told followers not to let anyone enter or leave the parliament building, where MPs and Mr Sharif met on Wednesday afternoon. The lawmakers had to use a rear exit to leave the building. Parliament was adjourned till Thursday. Employees of the civil secretariat and other offices in the vicinity also had to be evacuated under strict security, says our correspondent. Earlier on Wednesday, army spokesman General Asim Bajwa made the call for dialogue on his verified Twitter account. "[The] situation requires patience, wisdom and sagacity from all stakeholders to resolve [the] prevailing impasse through meaningful dialogue in larger national and public interest," he said. The buildings in the red zone were symbols of the state and were protected by the army, "therefore sanctity of these national symbols must be respected". 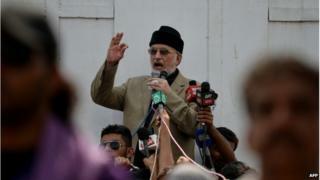 Mr Qadri said his group would not "violate the sanctity" of government buildings. The two opposition groups that are currently camped out in Islamabad are led by opposition politician Imran Khan and Mr Qadri. Both groups marched from Lahore. Both protest leaders want a change of government, and Mr Khan has accused Mr Sharif's party of vote-rigging in the 2013 election. The government has accused the protesters of attempting to derail democracy. They have offered talks with the demonstrators, but these have been rejected.